A few months have past since I have posted anything, sorry. We are very busy at the moment sorting out our house ready for the impending move. However, due to Jacob's birthday coming up, I thought I'd better get it up to date! We had a fabulous summer, mainly due to the Olympics. Although friends and family came into that equation too! I drove over to the UK with the children two weeks before the Olympics so that I could do some visiting and spend some time with the family. I started our trip by stopping off to see the Bullements. It was lovely to catch up with Tim, Helen, Will, Issy, Sam and Alice. We spent two nights and had lots of fun. We also managed to stop in and see friends from the Netherlands who had recently moved back - The Lofts. Great to catch up with them too and see their beautiful house. 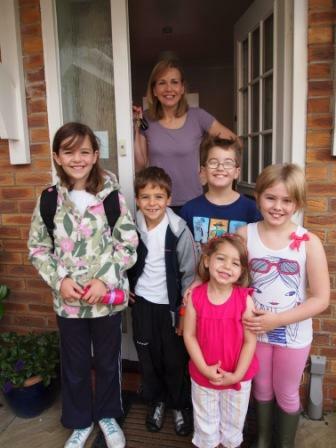 I've included a photo on Helen's doorstep, unfortunately Will had already gone to school! Next stop was Anne's in Knutsford. Again a two night stop. We had fun with Vicky and Emily. It was good to catch up. 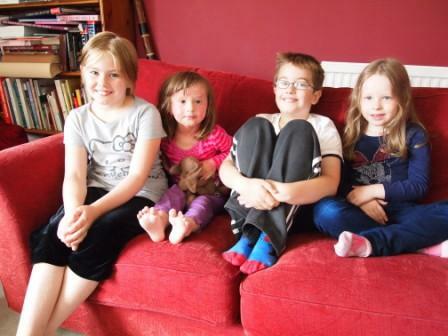 There is a photo of the children on the settee. A drive down south took us to Janine and Paul's, just outside Gloucester. Also managed to catch up with friends Bill and Gemma, who we knew when we lived there 10 years ago. We had just one night at Janine's as I had to get back to Mum and Dad's to enjoy a girls weekend away. I also didn't take any photos while in Gloucestershire! Mum and Dad kindly had Jacob and Abi so I could enjoy a weekend in Birmingham with Ali and Ruth. We stayed in a brilliant hotel, excellent breakfast that was really cheap. Went and saw a strange, but good, production of what happened next in Romeo and Juliet, shopped, ate and drank and had a good catch up. We saw some of the American Olympic team, their base was Birmingham, unfortunately, at the time, we didn't know any of the team as it was before the Olympics! Back in Holwell we then had time at camp - my sister was running a guide camp nearby, which we all enjoyed helping at and also spent time with my Aunt and cousins. I love living all over the world but I also love meeting up with family and friends. Allen then trained it over to arrive in time for our 15th Wedding Anniversary, we spent it back in Oxford - where we got married. It was a relaxing night and great to be back where it all started. Again, thank you to Mum and Dad for looking after J & A! Next post The Blunks arrival. Hi Rach, to be honest i still don't know which USA Olympic team members we saw and i have the photos! Great weekend. Thank you.